As we discussed in an earlier post, the ICC does not assert jurisdiction over terrorism, in part because drafters believed that the crime was not adequately defined under international law. Since the attacks of 9/11, this may be changing. Terrorism is a concept with a colloquial meaning that lacks a formal consensus definition under international law. An omnibus treaty definition of the crime of terrorism has eluded the international community to date largely because of the now trite adage: “One man’s terrorist is another man’s freedom fighter.” As a result of this normative ambivalence, codification efforts have yielded a number of treaties that require states to criminalize only specific terrorist acts (such as aircraft hijacking or attacks against internationally protected persons), but no truly omnibus definition. All criminal acts directed against a State and intended or calculated to create a state of terror in the minds of particular persons or a group of persons or the general public. The treaty attracted 24 state signatories; only India ultimately ratified the Convention. The onset of World War II scuttled any further efforts to bring the treaty into effect. After the dissolution of the League of Nations, the treaty was never revived. From this abortive start, the international community has proceeded in a piecemeal fashion by criminalizing various manifestations of terrorism (such as offenses committed on board aircraft, crimes against internationally protected persons, hostage taking, crimes involving maritime navigation, crimes involving nuclear material, and the financing of terrorism), often in response to particular terrorist incidents. To achieve some political, military, ideological, or religious goal. Many instruments and penal codes thus contain one or more specific intent or motive elements requiring proof of the existence of some mental state over and above the general intent to commit acts of violence. In some cases, this mental element is aimed at the civilian population (the intent to cause terror) or a government (the intent to influence a government). This emphasis on the perpetrator’s motive markedly distinguishes crimes of terrorism from other domestic and international crimes. (The more specific the actus reus of the treaty, however, the less likely that such a surplus of intent is required). ► either extradite or prosecute offenders pursuant to broad principles of extraterritorial jurisdiction. In this regard, the crimes of terrorism have been largely reponsible for the greater acceptance of passive personality jurisdiction in international law, as states increasingly assert jurisdiction over extraterritorial acts of terrorism committed against their nationals. Many multilateral instruments also limit their application to terrorism committed by non-state actors, implicitly or explicitly failing to recognize any notion of state terrorism. Other treaties limit their application to acts of “international terrorism,” thus excluding jurisdiction over acts of terrorism committed by sub-state actors operating solely within a single state. Any person commits an offence within the meaning of this Convention if that person by any means, directly or indirectly, unlawfully and wilfully, provides or collects funds with the intention that they should be used or in the knowledge that they are to be used, in full or in part, in order to carry out [any violation of an annexed treaty]. [a]ny other act intended to cause death or serious bodily injury to a civilian, or to any other person not taking an active part in the hostilities in a situation of armed conflict, when the purpose of such act, by its nature or context, is to intimidate a population, or to compel a government or an international organization to do or to abstain from doing any act. The Financing Convention is bolstered by a Chapter VII Security Council Resolution (1373) passed in the weeks following the attacks of September 11, 2001, requiring all states to, inter alia, suppress the financing of acts of terrorism and freeze financial assets of persons or entities involved in terrorism. ► Violent acts (such as murder, torture, or kidnapping) that specifically target civilians in the context of an armed conflict—whether international or non-international—will likely constitute war crimes. 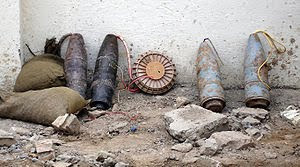 ► Where such acts are committed within the context of a widespread or systematic attack against a civilian population, they may constitute crimes against humanity under Article 7 (whether or not they are committed within the context of an armed conflict). The definition of crimes against humanity in the ICC Statute requires proof that the attack was “pursuant to or in furtherance of a State or organizational policy to commit such attack” (Article 7(2)(a)). Presumably, many terrorist groups could be shown to possess such a policy to attack civilians. ► Terrorist attacks may also implicate the prohibition against genocide, where the acts target a protected group with the intent to destroy that group. Although there are many instances of acts of terrorism being directed against a protected group (such as those committed during “the troubles” in Northern Ireland (right) or even the attacks of September 11, 2001), it may be difficult to prove the specific intent to commit genocide as opposed to the intent to intimidate or coerce a government—the hallmark of terrorism. It is worth considering what is left for a prohibition against terrorism to address if many violent acts already constitute either war crimes or crimes against humanity under international criminal law. ► For one, isolated or exceptional violent acts, committed in times of peace (or without any nexus to an armed conflict) and absent more systemic repression might not be considered a war crime or a crime against humanity. Prosecuting such acts at the international level or under international law would require the existence of a stand-alone crime of terrorism. 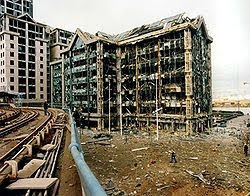 ► Secondly, a prohibition against terrorism may aid in the prosecution of acts of violence committed against privileged combatants by unprivileged combatants (such as civilians directly participating in hostilities or peacetime attacks on members of the armed forces (Khobar Towers below)). Such acts do not constitute war crimes. If such acts are to implicate international criminal law, as opposed to the domestic law of either the territorial state or the state of the nationality of the victim (assuming this law applies extraterritorially), the international community will have to achieve consensus on an omnibus definition of terrorism. In the past, a number of geo-political situations involving occupying, colonial, or racist regimes prevented this consensus from forming. Fortunately, many of these situations (such as South Africa) have been resolved in favor of the principle of self-determination. The situation in Israel and the Occupied Territories, however, remains one of the few obstacles to completing the remaining definitional work on the crime of terrorism. Many members of the international community are unwilling to unequivocally condemn all acts of violence committed by Palestinian and allied forces given the perceived justness of their cause. That said, a consensus is crystallizing around the judgment that acts of violence targeting civilians are never justified, regardless of the justness of the cause in question. By contrast, the legal categorization and consequences of attacks by unprivileged combatants against privileged combatants or military objectives remains an unsettled and highly contentious area of international law. Resolving the situation in this part of the world would remove this distortion in the normative development of international criminal law—as if we needed another reason to accomplish this critical and elusive end. (This discussion is drawn from my recent article on the cognizability of a tort of terrorism under the Alien Tort Statute, produced for a conference on civil litigation and terrorism at the University of Texas (Austin). The article appears in The Review of Litigation, a publication devoted to the theory and practice of litigation, and is available here).